Dear President Obama, Thank you for coming to Cleveland to bring attention to environmental injustice in Northeast Ohio. "Sadly, no one in government or community development sought a second opinion"
End of the road in bridge debate is blighted Cleveland getting more blighted, and ODOT and NEO saying "so what". Steven Litt is slowing down ODOT's "Racing to design a new bridge for I-90". Hallelujah! Submitted by Norm Roulet on Sat, 02/11/2006 - 12:48. Linked in this book (see contents below) are articles on one of the most important public improvement (or disruption) projects of the next decade: the redesign of the I-90 bridge over the Cuyahoga River in Cleveland and the route of I-90 through the Cleveland "Inner-belt Trench". 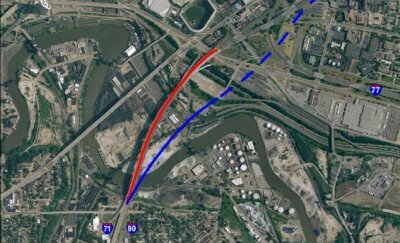 This has been determined to be a very high traffic, high accident route and the I-90 bridge has been deemed inadequate and in disrepair by ODOT, so nearly $1 billion in local, state and federal money is being spent to repair and/or replace the bridge and streamline the flow of traffic through the trench. All of this has huge implications to the look, feel and flow of Cleveland, not to mention the local economy and the economy of the region. As such, this is considered a "third rail" issue in Ohio, with a high level of political lobbying and dealmaking in the background, as is to be expect for a $1 billion federal project. Many NEO leaders are speaking up with very specific ideas they would like considered as alternatives to some of the plans currently on the table for the bridge and trench. As this is such a popular, populist issue, we are placing all related content in this special issue feature as articles listed below. You may also find content on these issues by searching REALNEO for such keywords as ODOT and NEOBRIDGE, and you may look at listings in the NEO Signiture Bridge category found here. And, please note, there is a related site addressing these issues at http://neobridge.net/. The site is open for anyone to register and post content... you can even log in with your realneo account. To do so, log in there with your username as your realneo username followed by "@realneo.us" (e.g. Norm Roulet [at] realneo [dot] us) and use your usual REALNEO password. Please become involved in planning these major projects - participate here and at NEO Bridge. Turmeric’s Powerful Life-Promoting Properties Put Pharmaceuticals to Shame - anti cancer - cancer cure etc.